Onion is fried till brown and ground into paste along with tomatoes. Almond gravy is prepared with ground blanched almonds, onion tomato paste and spice powders. Paneer is cubed and added the to almond gravy as a finishing step. Serve paneer in almond gravy with pulka or roti or with pulao. Makes: around 2 Servings of Paneer in Almond Sauce. Cut the paneer into small cubes and keep them soaked in cold water till required. Soak almonds in warm water for couple of minutes and peel the skin. Discard the peeled skin and grind the almonds into smooth paste adding enough water. Heat oil in a pan, add sliced onion. Fry till onion turns light brown in color. Cool the fried onion to room temperature and grind onion, tomato and green chile into smooth paste. Heat oil in a pan, add cumin seeds, bay leaf and star anise. Fry till cumin seeds change color, add ground onion tomato paste, almond paste, red chili powder, garam masala powder, crushed kasoori methi and salt. Boil till oil separates from the almond gravy (around 10 minutes). Stir in cubed paneer, cilantro and remove from heat. Serve paneer in almond gravy with pulka or roti or with pulao. Notes: Make sure not to over cook once the paneer is added. Suggestions: Make sure not to burn onion while frying. Variations: Check other recipes with paneer here. Other Names: Paneer in Almond Gravy. Fresh vegetables like tomato, onion, green bell pepper is finely chopped up and mixed with boiled cornn and crumbled paneer. The mixture is seasoned with crushed black pepper and mixed with lemon juice. Serve paneer salsa as a salad or as a stuffing in a bread sandwich and toast it. Makes: around 4 Servings of Paneer Salsa. If using frozen paneer, leave the paneer outside to let it come to room temperature and crumble it. In a mixing bowl, mix together crumbled paneer, chopped tomato, onion, corn, green bell pepper, cilantro, crushed black pepper and salt. Stir in lemon juice and leave aside for few minutes. Serve paneer salsa as a salad or as a stuffing in a bread sandwich and toast it. Notes: Make sure to chop the vegetables in same size. Suggestions: Adjust spice with black pepper. Variations: You can also make fresh paneer and use it. Click here for home made paneer recipe. Thick paneer is slightly frozen and grated into big chips. Sugar is heated and made into thick gooey syrup. The paneer chips are then caramelized with the sugar syrup. Once cooled, serve paneer chips as a desert. Freeze the paneer until little hard. 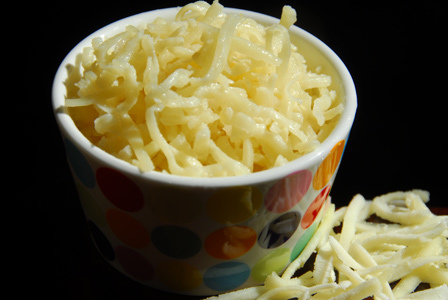 Grate the paneer using thick side of the grater into long chips. Heat sugar, ghee and quarter cup of water in a pan. Boil till sugar melts and starts to caramelize. Once the sugar is thick and forms a very soft ball when dropped into water, remove from heat. Carefully add the grated paneer with minimal stirring. Once it cools down to room temperature, put the paneer chips on absorbent paper. Store sweet paneer chips in a jar and refrigerate and serve as required. Notes: Make sure to get the sugar syrup right. Suggestions: Make sure paneer is frozen just enough and good to be grated. Variations: Check other desert recipes here. Other Names: Sweet Paneer Chips. Onion and tomato is cooked in tempered oil along with cumin seeds till a thick gravy is formed. 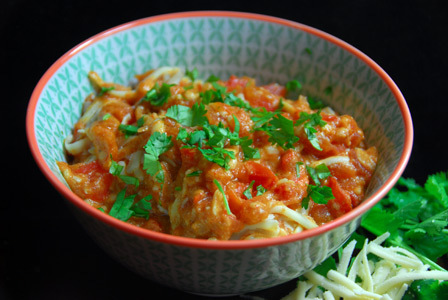 Fresh or frozen paneer is grated and added to the onion tomato gravy. 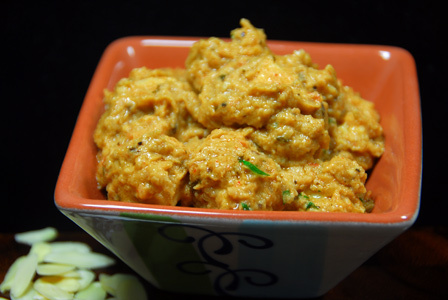 Grated aneer bhurji can be served with roti or with steamed rice. Makes: around 4 Servings of Grated Paneer Bhurji. Grate the fresh paneer using thicker side of the grater and keep aside. Heat oil in a pan on medium high heat, add cumin seeds and ginger garlic paste. When cumin seeds start to sizzle, add chopped onion. Fry the onion till it turns brown around the edges. Then add green chiles and chopped tomatoes. Cook till tomatoes completely soft. Stir in garam masala, red chilli powder, turmeric powder and salt. Fry briefly, stir in around quarter cup of water. Stir in grated paneer and garnish with chopped cilantro. 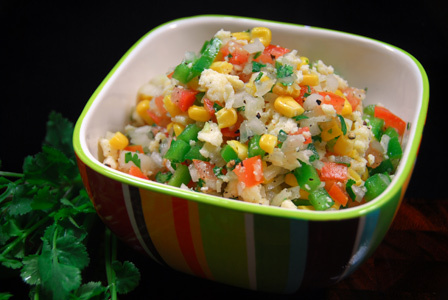 Keep covered until necessary and serve paneer bhurji with roti or with rice. Notes: Make sure paneer is very tight so that it can be grated. Suggestions: Adjust the spice with either green chiles or red chile powder. Other Names: Grated Paneer Bhurji. Paneer is cubed and the vegetables are chopped into chunks. They are then marinated in the yogurt mixture having spices and herbs. Then the marinated paneer pieces are threaded to the skewers and grilled on high heat for couple of minutes till done. Serve tandoori paneer with mint chutney if desired. Makes: around 4 Skewers of Simple Tandoori Paneer. Peel and grate the ginger and garlic. Wash, remove stems, discard seeds and chop the bell pepper into chunks. Peel, wash and chop the onion into chunks. Wash and finely chop mint leaves and cilantro. If using frozen paneer, soak the paneer in warm water for couple of minutes for it to soften. Chop the paneer into inch cubes. For marinade, add yogurt, ginger garlic paste, lemon juice, mint leaves and cilantro into a bowl. Mix well and stir in chopped vegetables and paneer. Cover and refrigerate the marinade for around 3 hours. 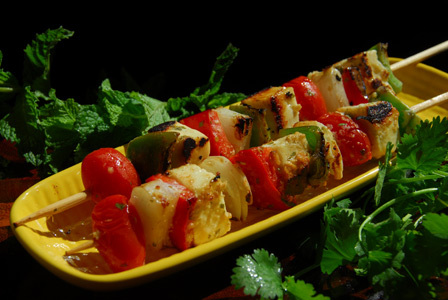 Use 4 – 5 wooden skewers to thread the pieces of the marinated paneer, bell pepper, onion and tomato. Sprinkle salt and brush the skewers with oil. Place the skewers on hot flat pan. Let one side of the pieces turn dark golden brown before turning the skewer on other side. Repeat on all sides and remove onto a plate. Serve simple tandoori paneer with roti or as a starter. Notes: Use a grill on high heat to make these tandoori paneer. Suggestions: Use regular tomatoes and chop them into chunks discarding the seeds in case you can’t find grape tomatoes. Add few ground green chiles to the marinade for spice. Variations: You can also add few sprinkles garam masala or chaat masala or cumin powder to the marinade. Use coloring in the marinade for red tandoori color or use few pinches of turmeric instead. Other Names: Simple Tandoori Paneer.